The backs of my VaultBacks present me with almost half of the work on the guitar, but the acoustical benefits far outweigh the workload. They are all hand carved, inside and out, and each tantelon and cleat is painstakingly fitted entirely by hand. I decided a long time ago that structural refinement was the way forward, (something that simply is not financially viable in a factory environment) so I employed tantelons, instead of kerfed linings, for all of my instruments. 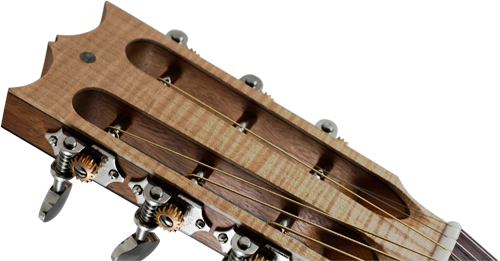 "Tantelons" are the small blocks you see around the peripheral of the guitars' rib edge. With a pronounced curve on the back such as this it would be extremely difficult to fit kerfed linings to that profile anyway, but the tantelons don't just act as a structurally refined bond between back and ribs; they aid in the diffraction and reflection of sound waves, and help to eliminate standing waves in the same way that the arched back and cleats do. If you diffract and reflect sound waves - instead of letting them bounce back and forth in a standing wave - they flow, and sustain. The analogy I would use is that of a stairwell. If you clap your hands in a stairwell the sound diffracts and reflects off of all of the different angles and through slits in there, and sustains for a long time, and that sound is superiorly acoustically pleasing. This is also largely dependent on said areas' choice of construction materials, and in hand, their absorption coefficients, of course; which is another thing I indeed consider for each instrument, depending on the customers' desired final tone - on my multiple wood VaultBacks, an amalgimation of absorpsion coefficients is employed for a particular balanced tone which I have sought. 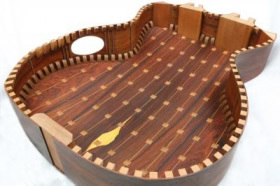 If you had a box like guitar body, square and flat, the sound waves would decay quickly as they would lose their energy quickly bouncing back and forth, and sound, boxy. This is, however, very much dependent on the amplitude of the frequency. Some notes with a larger than normal amplitude can become over excited in a standing wave, if the wave length is right for the size of parallel surfaces, and the absorption coificient is appropriate, the conditions are there to create a "wolf note", which is as, if not more, undesirable as a quickly decaying note. These "wolf notes" come from an instrument that has an affinity for one certain frequency, in a certain area. The cleats, (small squares along the joints) also help to diffract and reflect sound waves. Coupled with the topography of my bracing, this backs' inside design stops any one note, or frequency, being overly dominant, and gives the guitar incredible sustain. The tantelons that attach the back to the ribs all have their own unique, individual curve, because the backs' curve is very inconsistent. These tantelons alone take 14 hours for me to fit. The cleats serve as a stitch to reenforce the joint on every stave of the curved back. They too have to be fitted individually to the curve, then are shaped later to minimise weight and give a more aesthetically pleasing profile whilst giving yet again more reflection points at the same time. This back has taken 260 hours to construct, but again, the benifits far out-weigh the workload.